LG and Sony both confirmed to Cnet that none of their new TV sets released this year, even high-end models such as their new OLED TVs, will be able to show 3D movies and TV shows. LG's director of new product development, told the tech site that 3D capability was never universally embraced in the industry for home use, and is not a key buying factor when selecting a new TV. The South Korean manufacturer is now focusing on new capabilities such as HDR [image-improving High Dynamic Range], which, the LG executive reckons “has much more universal appeal." A Sony representative also confirmed to Cnet that, based on current market trends, the company will not support 3D for their 2017 models. The move comes after Samsung and Philips decided to stop producing 3D TV in 2016. Smaller brands like Sharp, TCL and the Chinese did not announce any new 3D TVs at CES 2017. 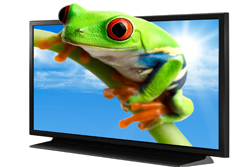 According to data from the NPD Group, sales of 3D TVs have declined every year since 2012 (when it accounted for 23%), representing just 8% of total TV sales in 2016, down from 16% in 2015. Sales of 3D-capable Blu-ray players also fell to just 11% of the market in 2016, compared to 25% in 2015 and 40% in 2012. "Things like 4K/UHD, HDR and even smart have become the key features along with screen size that consumers are buying on,” says Ben Arnold, executive director at NPD. The theatrical success of James Cameron’s Avatar in 3D triggered early interest in the technology. The 3D feature started to be offered on select TV models since 2010. To enjoy the 3D experience requires 3D glasses, something that ultimately did not find favour with enough consumers. Though, some analysts have pointed out that the CE industry did not deploy much marketing effort to push the technology. 3D TVs may be on the decline, but thanks to the format's continued popularity in the theater, there is a wealth of 3D Blu-ray titles on offer, and Cnet notes that studios keep bringing to the market 3D versions of recent movies, including the record-breaking Star Wars: The Force Awakens. Their list of their favourites also include: Gravity, The Lego Movie, Guardians of the Galaxy, Brave, Captain America: The Winter Soldier, Life of Pi, Mad Max: Fury Road, The Martian, Avatar, The Walk: A True Story, Coraline, Legend of the Guardians: The Owls Ga’Hoole, Rise of the Guardians, Dawn of the Planet of the Apes, Sin City: A Dame to Kill For, Pacific Rim, How to Train Your Dragon, How to Train Your Dragon 2, Despicable Me 2, Wreck-it Ralph, Tangled, Hugo, Cloudy With a Chance of Meatballs 2.